Can the Dutch claim their fourth World Cup title at Bhubaneswar? Two European neighbors marched into the finals of the Odisha World Cup in stunningly contrasting styles at the Kalinga Stadium on Saturday. While the Olympic silver-medalists Belgium decimated Danny Kerry's English side by an emphatic 6-0 margin, the Dutch who won silver in the last edition of the World Cup, overcame two-time defending champions Australia in a nail-biting sudden-death shootout. The Dutch were devastating up front and exposed the vulnerabilities in the Aussie defence by scoring one goal each in the first and second quarter, which the Kookaburras had no answer to. Colin Batch's world champions pulled one back before the end of the third quarter and scored a sensational equalizer with twenty seconds left on the clock to force a shootout which was finally settled in favor of the Dutch via sudden death. The manner in which Max Caldas' boys went about their lightning-quick counter-attacks against the Australians was quite a revelation, but they will be up against a side who did pretty much the same against the English - without breaking into as much of a sweat. Head-to-head numbers between the two World Cup finalists may well be deceptively loaded in favor of the Dutch who have a rich hockey tradition behind them - unlike the Belgian Red Lions who rose like a meteor post-2013 and defeated their more illustrious rivals in the semifinals of the Olympic Games of 2016. Belgium's 3-1 win over the Dutch, at Rio, was an important turning point in the way the two sides perceived each other - and was followed a more emphatic 3-0 victory which the Red Lions achieved against the Netherlands in the Hockey World League Finals at Bhubaneswar last December. 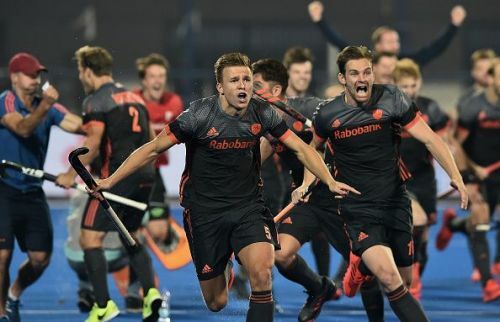 At the Champions Trophy at Breda, earlier this year, the hosts turned the tables on the Red Lions, winning by a massive 6-1 margin, and will look for a repeat performance when the two sides meet on a far bigger stage on Sunday evening. The Belgians, on the other hand, would like nothing better than to win their first-ever World Cup title, having made it to the finals for the very first time. Pirmin Blaak and Vincent Vanasch have been outstanding in goal for the Netherlands and Belgium respectively - and with the strikers wreaking havoc in the semi-finals, an enthralling classic is on the cards on Super Sunday. As Max Caldas, Head Coach of the Netherlands side told Sportskeeda after the match, "Will be an interesting game between two teams that know each other very well - and like to battle with each other." While the Belgians impressed against England - for the manner in which The Netherlands overcame a formidable Australian side, the Dutch start favorites, in what is expected to be a razor-sharp contest. Follow Sportskeeda for all the latest updates from the Hockey World Cup. Check the Hockey World Cup Points table, schedule, stats & previews.